Hamilton Academical midfielder Darian MacKinnon will be suspended for four matches after accepting a charge of violent conduct against Dundee United. He received an automatic one-match ban, plus another for being sent off a second time in the same season. But he has also accepted a two-game suspension for separately "striking an opponent with an arm or elbow". MacKinnon had been reported to Scottish FA compliance officer Vincent Lunny for a clash with United midfielder Paul Paton not seen by referee John Beaton in the ninth minute of the match. He was then sent off after 30 minutes, having been shown a second yellow card by Beaton for pushing a Dundee United player while celebrating an Accies goal - and having been booked earlier following an incident with United striker Nadir Ciftci. Hamilton, who currently lead the Scottish Premiership, will be without the midfielder for league matches against Kilmarnock, Motherwell and Celtic. He will also be absent for the League Cup third-round derby against Motherwell. 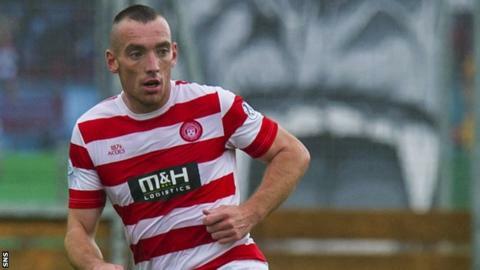 MacKinnon made a late move into Scottish senior football after signing for Accies from junior outfit Clydebank in 2012.